What wonderful inspiration Tim provided for this years 12 Days of Christmas Tags. Although I didn't have all crafty items needed to complete the tags, I certainly had fun improvising and making them my own! So on Day 12, I am improvising yet again! 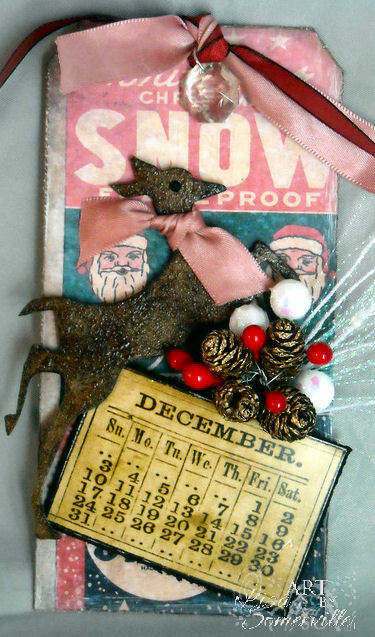 I used the fabby reindeer die yet again, covered him in Walnut Distress Ink, then applied some Crackle Accents and Distress Rock Candy Stickles. The December Calendar is from the Salvage Stickers. The lighter ribbon, was actually White, I dyed it with Red Perfect Pearls Mist. 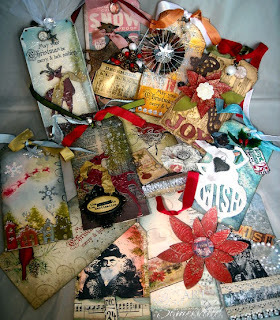 Special thanks to the following: Tim Holtz for sharing his inspiration, The Artistic Stamper Challenge and ArtyJen who provided those of us creating a place to link in and share our tags, and to those of you who stopped by and left me wonderful comments! I thank you! 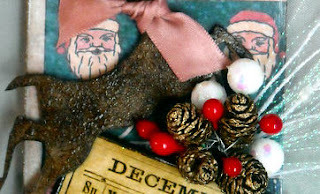 Great array of tags and I love this last one with the little mini calendar on it! Terrific interpretation of Tims' tag Lisa, I love it and never knew you could use perfect pearls on ribbon so thank you for the tip. I just had a chance to look back at all the tags, they are beautiful!! Each one a piece of art, I couldn't pick a favorite it I had to. Excellent work. Good for you, Lisa! Your tags are beautifully crafted. WHOO hOO! Fabulous array of tags! Love today's tag. Beautiful reindeer and the paper is lovely! I love your tag 12! It has been so much fun! Thanks for all your comments. HAPPY HOLIDAYS! wow Lisa - beautiful job! The tags all look so beautiful together. That dear deer sure came in handy, luv how you put this one together, and they ALL make a wonderful splash!